Get info and book now, the demand is high! Get info and book now. 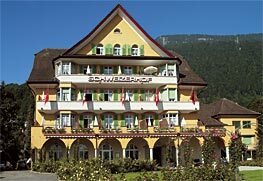 The Hotel Schweizerhof is situated on one of the loveliest spot on the lake of Lucerne and is the ideal place for an unforgettable holiday. Quiet but yet centrally located. It’s right in the centre of the village and only a few steps away from the lake promenade and the ship landing dock. Weggis- Mediterranean coast of central Switzerland – relaxation, sport and pleasure for any age group and budget.